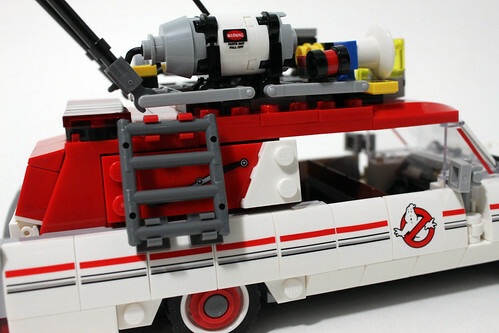 When the LEGO officially announced the Ghostbusters Ecto-1 & 2 (75828) set, there was very mixed reactions to it, much like to the trailer when it came out, although it was towards the positive side more unlike for the trailer itself. 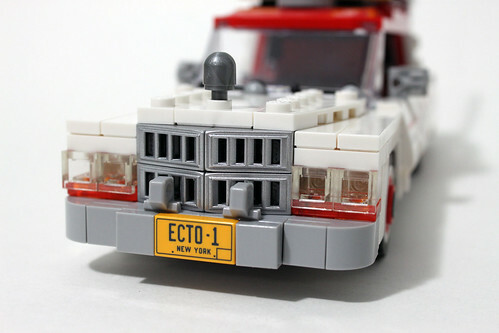 For me personally when I saw the details of the new Ecto-1, I actually liked it because of some of the details and features it has which I’ll get to later on. 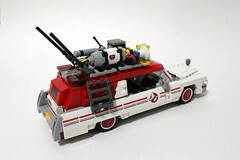 The Ecto-1 & 2 contains 556 pieces and retails for $59.99 which actually isn’t too bad for a licensed set. 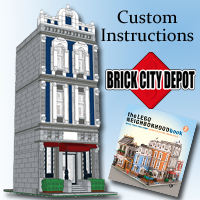 The contents of the box includes four numbered bags, one instruction booklet, and a small sticker sheet. 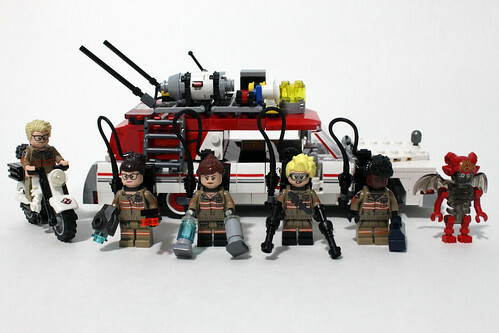 There are six minifigures included in the set: Abby Yates, Erin Gilbert, Jillian Holtzmann, Patty Tolan, Kevin, and Mayhem. 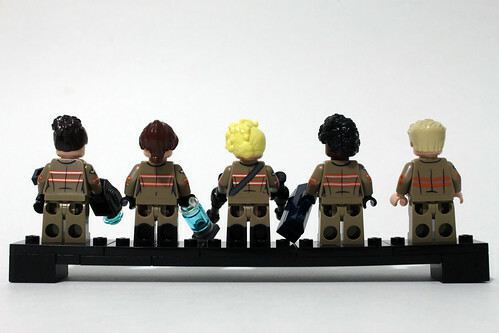 I will note that all of the torsos and legs for the Ghostbusters uniforms are unique. All of the printing is highly detailed which includes the characters’ initials on the name tag while Kevin’s name is spelled out. The arms have printing of the No-Ghost symbol which is nice to have. For the legs, Erin and Jillian’s are dual-molded to represent the boots they wear. 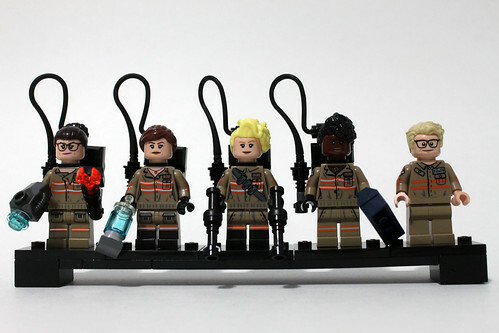 As for the head pieces, all five Ghostbusters have double-sided heads showing off alternate expressions. 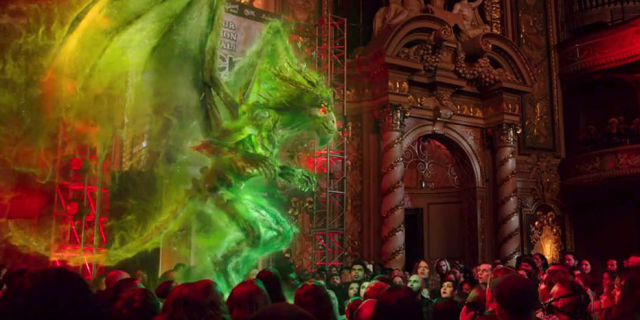 As seen in the trailers, Kevin has been possessed which is shown with him having red eyes. 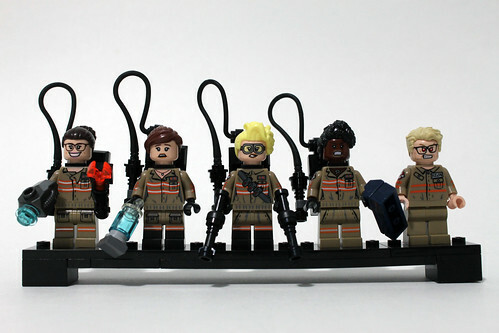 Furthermore, a few of the Ghostbusters have new hair mold pieces like Jillian and Patty. 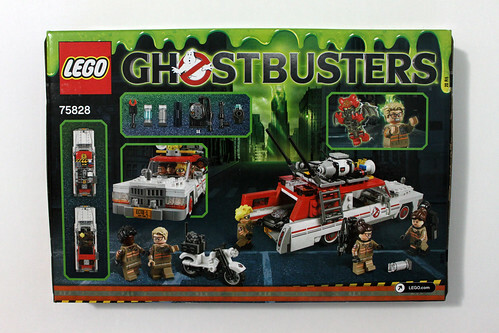 Each of the four main Ghostbusters has a slightly updated proton packs which are attached to the minifigures with the usual next bracket pieces. 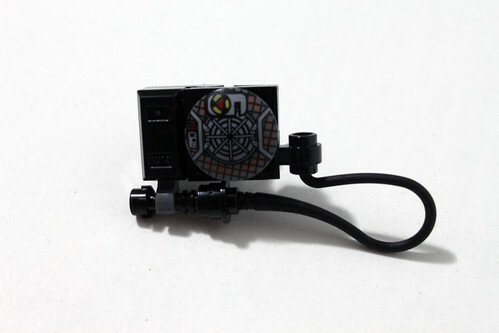 The 2×2 round Cyclotron pieces have a new design to represent the new proton packs. There’s also some new black 1×2 ingot pieces which are nice to have. 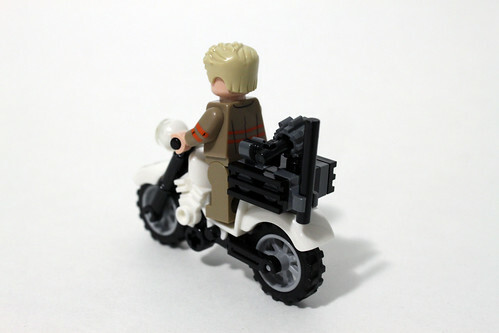 Finally, all of the Ghostbusters have additional unique accessories. 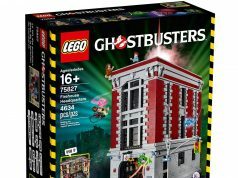 According to LEGO’s description of the set, Abby has a new PKE Meter and an ion shield gun. I believe you can see Abby use the ion shield gun in the second trailer but as a fist weapon instead of a projectile weapon. 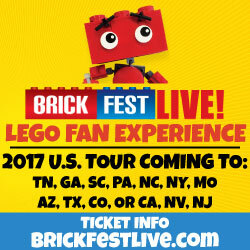 Erin has two traps, one of which has a trans-light blue 1×2 round brick to maybe represent an empty trap while the gray one is the full trap. Jillian has a proton sidearm which you can see her lick in the trailer but the instructions only let you build one even though she has two of them. 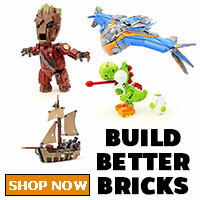 You can actually create another one using the extra pieces from the set to create a second one. 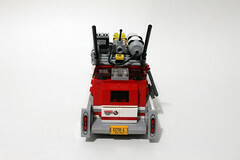 Lastly, Patty has a dark blue toolbox which is only the second time it has appeared in a set with the first being in the Ghostbusters Firehouse Headquarters (75827). 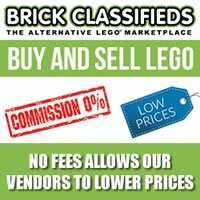 The last minifigure in the set is Mayhem. The body uses the typical skeleton torso in trans-black while the arms and legs are red. The head piece has a cool new design with an angry expression with electricity coming out the eyes. 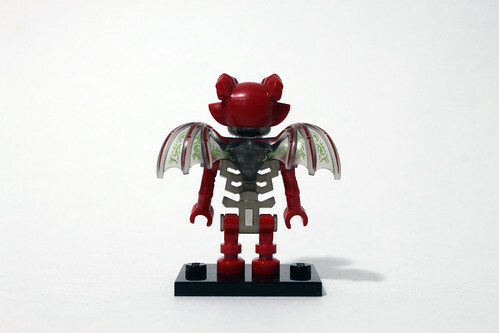 Mayhem also has a red horned head piece and a wings which were first seen with the Gargoyle from the Monster Collectible Minifigures (71010). The horns has some sort of printing on it but they are a little short from what was shown in the trailers. The wings also have some similar printing as with the horns. 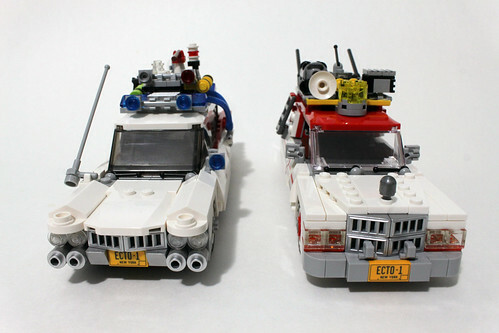 There are two builds in the set which obviously are the Ecto-1 and Ecto-2. 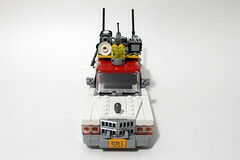 The first is Kevin’s Ecto-2 which is a motorcycle with some equipment on the back. 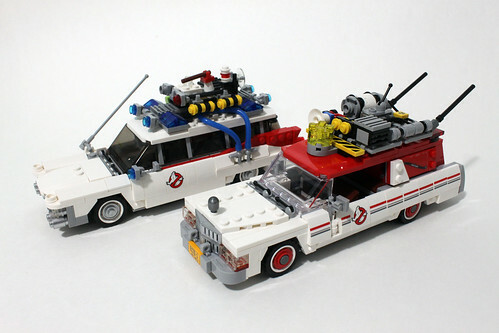 The white chassis looks good, especially next to the Ecto-1. 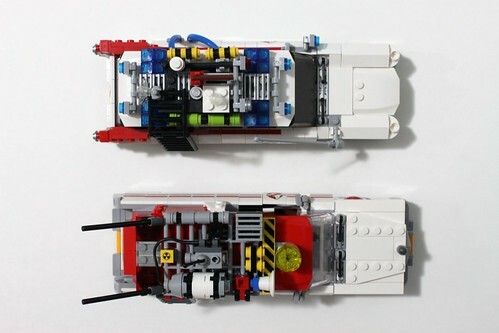 It’s a very rare piece as it has only appeared in the Jokerland (76035) set. There’s also a No-Ghost symbol sticker on front of the motorcycle. 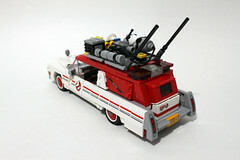 The Ecto-1 is based on the 1980s Cadillac Superior Hearse and the model is a good representation of it. 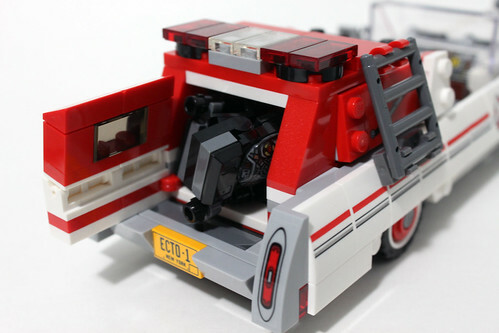 The front of the car is very well done with some metallic silver grill pieces along with trans-clear headlight bricks and trans-orange plates for the headlights. 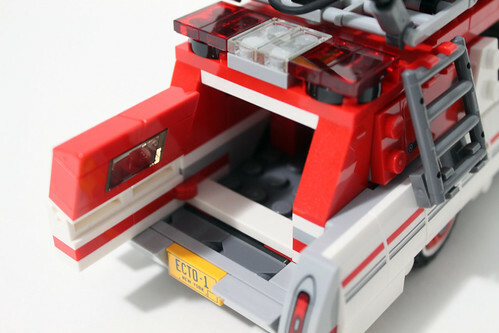 The bumper uses the SNOT technique to give its look with the printed yellow Ecto-1 license plate. 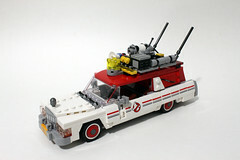 The hood ornament is just a gray bulb piece to represent the Slimer ornament on the movie car. I guess this is acceptable since there was no new piece for that. Heading towards the windshield area, there are a couple of antenna pieces to represent the windshield wipers. For the windshield itself, there are a couple of stickers on each side to show the red pillars of the car. On each side of the car are a couple of side-view mirrors as well. 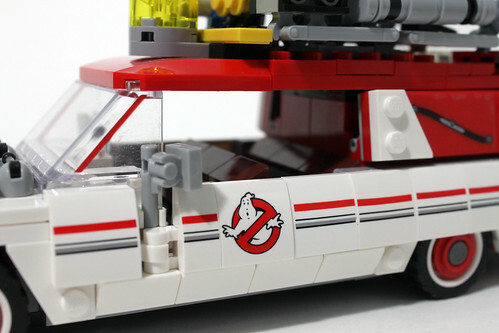 On the sides of the car, we have some printed stripe pieces as well as the Ghostbusters No-Ghost logo on the front doors. This must be a relief for those who aren’t too fond of stickers. For the wheels, I do like the red rims on it to give it that classy feel for the car. Towards the back of the car, the right side has a ladder to go up to the roof of the car which I’ll get to later. The back is able to open up to reveal a little storage area for the proton packs however there’s not enough room to hold all four packs. On the outer rear door, there’s a caution sticker on it. There are also some stickers for the tail lights, which surprisingly, doesn’t look too bad. 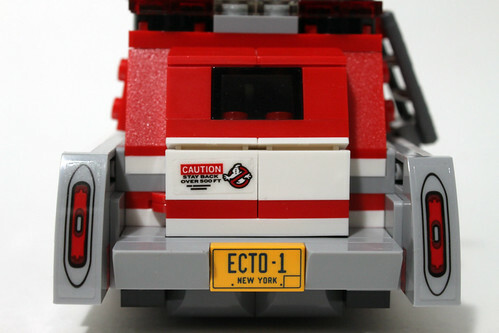 You also get another printed yellow Ecto-1 license plate on the rear bumper. 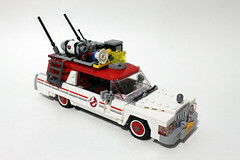 Like the original Ecto-1, the top of the new car has slew of new ghost busting equipment. There’s a large yellow light near the front as well as a loudhorn. In the middle heading to the back is a large nuclear reactor. There are some stickers in this area like the radioactive symbol next to the reactor as well as a warning sign on the reactor itself. In the front, there’s a yellow hazard strip behind the light. 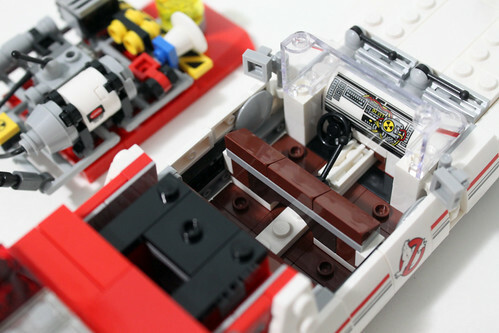 The last feature for the Ecto-1 is the removable top to access the inside of the car. 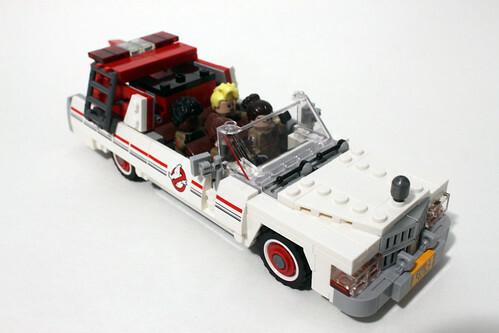 There is now room to seat all four Ghostbusters inside which was a problem in the LEGO Ideas Ecto-1. There’s even room for the steering wheel as well as the handbrake. The dashboard is a sticker with lots of detail like the radiation hazard symbol on the passenger side. 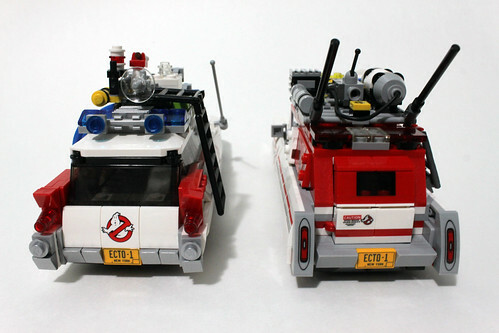 The new Ecto-1 is about the same size as the original one with many details taken from the first one and implemented on the updated version. Each of them has their own unique style so it’s debatable as to which one is better. 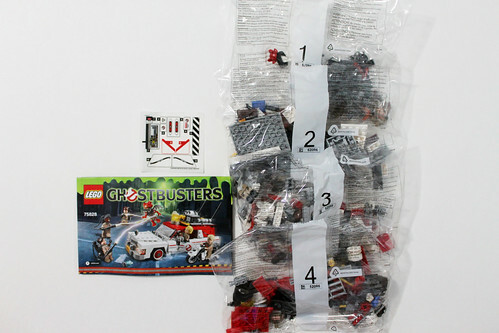 Overall, the LEGO Ghostbusters Ecto-1 & 2 (75828) set is no doubt an update to the original LEGO Ideas Ecto-1 (21108). 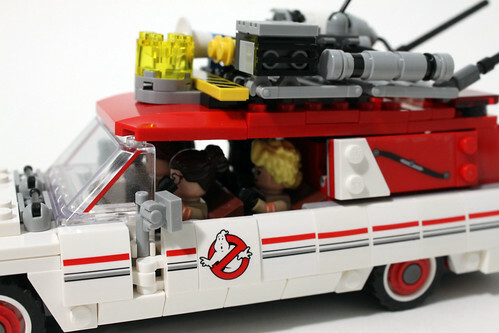 The minifigure selection is great with all the little details each one has and plus all of the Ghostbusters fit into the car at the same time. 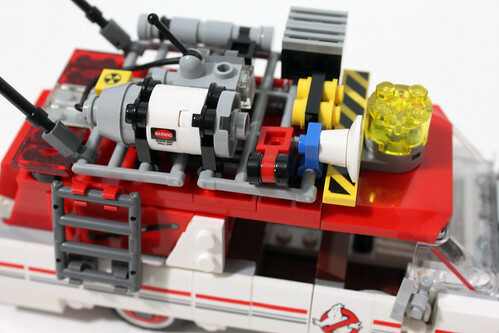 The Ecto-1 itself is a very nice representation to the one in the movie and that sometimes is hard to achieve in LEGO form as we’ve seen before with other movie sets. One thing I didn’t really like about it were the stickers as some of them were very small and may be hard to apply. 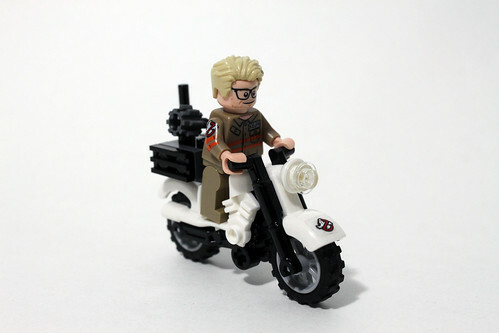 Also the Mayhem minifigure is somewhat small for what was shown in the trailers but it’s good enough as additional parts to create a brick-built Mayhem may drive the price higher. Another criticism that some may have is that it is a reboot movie and that itself might prevent some from getting the set because it is a disservice to the original movies since it is an unnecessary reboot. From what I’ve seen in the comments for the set on different social media outlets, some really like it while some absolutely despise it, simply because of the movie itself. 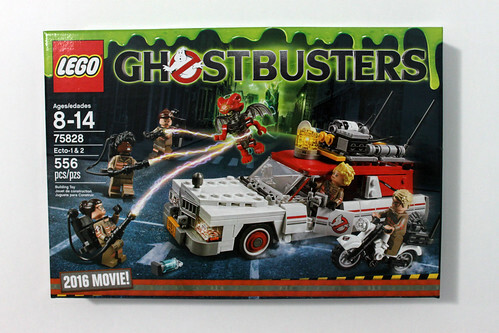 For me personally, I like the set a lot with the new minifigures and the updated look of the Ecto-1. 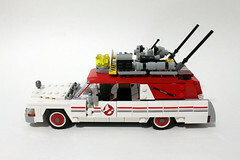 The Ecto-2 wasn’t necessary but it was a nice addition. 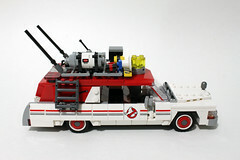 I am looking forward to the movie but I have a feeling that the new Ecto-1 itself probably won’t reach the iconic status of the original one.